We’re edging ever closer to Apple’s official unveiling of the highly rumored iPhone 5se, which is expected to be announced during a March media event. 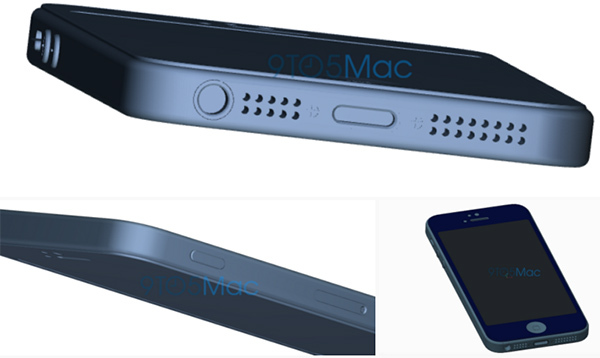 In order to get to this point we’ve had to sift through countless leaks and conflicting design rumors that suggest Apple’s new 4-inch iPhone could have a similarity to the iPhone 5s, especially in terms of screen size, but that in terms of design it could take some inspiration from the curved aesthetic of the iPhone 6 series. Now, a new set of design schematics have surfaced, suggesting that the design of the new iPhone could be identical to that of the iPhone 5s released in 2013. If the schematics provide us with an accurate reflection of what is to come with the iPhone 5se, then it looks as though the smartphone could share what are essentially the same dimensions as the iPhone 5s. 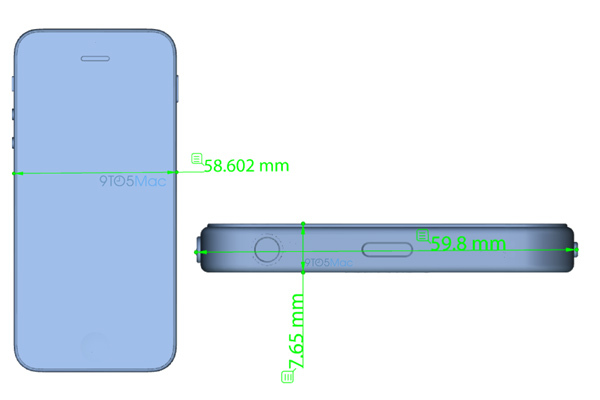 As 9to5Mac tells us, that would mean the iPhone 5se would measure in at approximately 123.8mm tall, 58.6mm wide, and have a thickness of 7.6mm. The location of all of the important hardware elements of the device also look to be positioned in the exact same positions as Apple’s previous 4-inch offering, barring the Lock/Power button, which seems to have been relocated to the right of the phone, just like the iPhone 6 series. There’s also familiarity with the positioning of the Home button, volume buttons the camera module and associated LED flash, as well as the speaker grills, Lightning port, and 3.5mm headphone jack on the underside of the purported device. Sources also suggest that the phone will have a slightly curved glass towards the edges, but not as curved as the iPhone 6 and iPhone 6s. 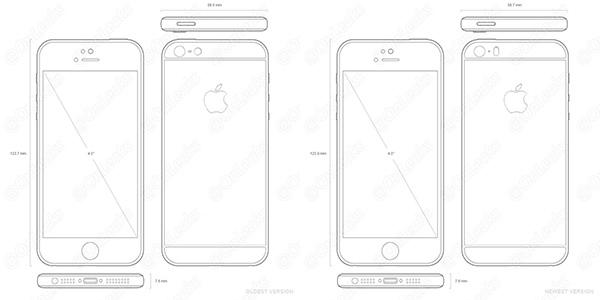 Additionally, the popular @OnLeaks has also released a set of schematics which shows a similar looking design followed by the same dimensions as reported by another source above, but goes on to suggest that Apple currently has two prototypes in testing with the Lock/Power button retaining its original position on top like the iPhone 5s. The design drawings also show a protruding camera module on the rear of the device with a pill-shaped flash sitting beside it. 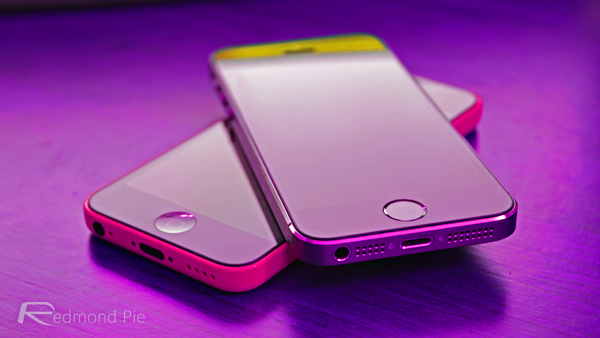 The sources suggest that the camera will be identical to the one offered with the iPhone 5s. There are clearly a number of conflicting opinions on this one, but all sources seem to agree on the overall look and aesthetic of the hardware. Apple is expected to use its rumored March media event to reveal the new iPhone model. It will likely be offered in the same color combinations as Apple’s current flagship iPhone 6s, as well as a new pink color option. The design schematics actually brings up an interesting alternative to Apples home button.. If they could essentially make the back of that iPhone, the front, where the screen takes up a larger area, and the home button one large clickable area. This could also be used for quite a powerful tool, if they implement a Mac-style “click-pad”, where the user can click in any area to go “home”, or swipe to move the text cursor, or click and swipe to activate Siri, or different functions. This would work very well in lowering the bottom bezel, and offer extreme convenience. I truly hope that they do this! I havent actually bought an iPhone since 2008, and have owned almost every major Android phone since then.. But I can tell you there hasnt been any major innovative improvement for the bezels that actually matter (the bottom bezel). The only phone with crazy thin bottom bezel is the Nexus 6, which I owned, and absolutely loved, until I switched to the Note 5, which utilizes the bottom bezel, and theoretically saves more space.